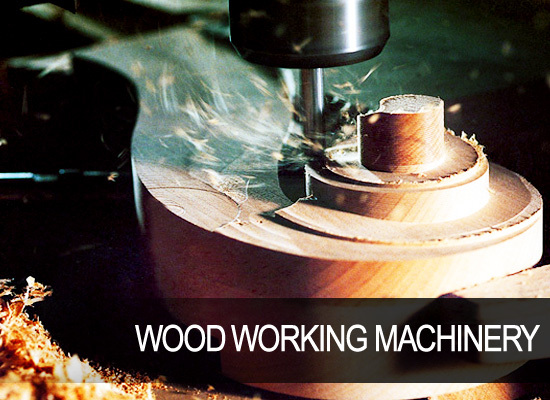 The very robust machine structure allows for installation of powerful hydraulic accessories that easily handles even very heavy timber. 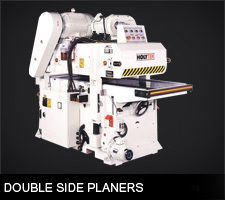 Two way guidance of the bridge frame on the travel section in combination with a strong motor allows for smooth and quick pulling of even heavy cut pieces while using the sawn timber material feeder. 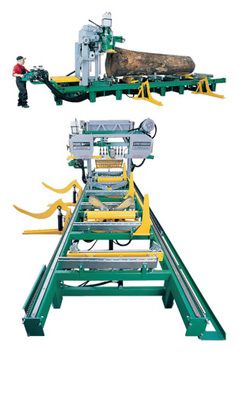 The machine is equipped with rapid travel of the bridge frame with automatic deceleration at end positions. The extension sections with cutting lengths of 2, 4, and 6 metres allow for installation of hydraulic accessories according to your requirements. 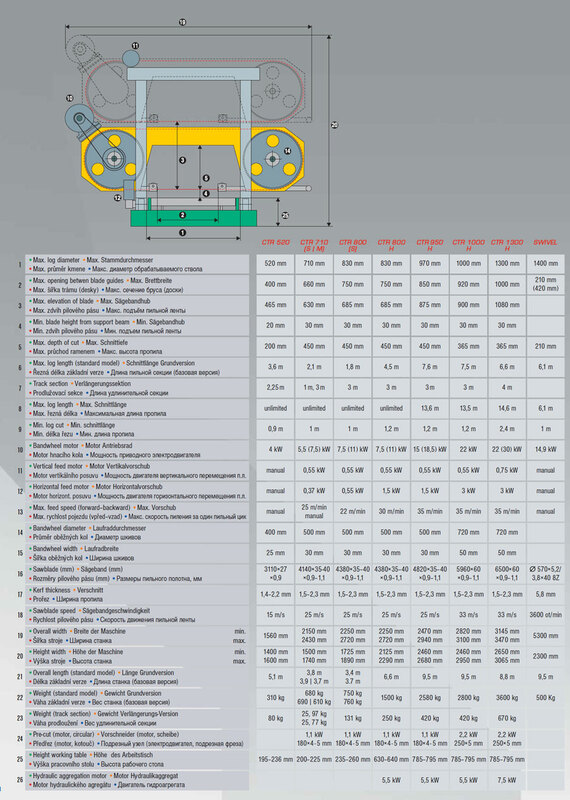 The basic travel section and the extension sections are equipped with many clamping points for installation of hydraulic accessories, which allows for large flexibility during the design for the customers exact requirements. The most important, multifunctional tool of all the hydraulic accessories. 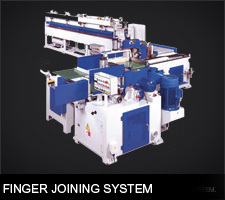 It moves in the vertical and horizontal axes on rugged hard-chrome rods using two separately controlled hydraulic cylinders. 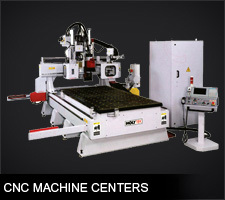 It serves for clamping, turning, and feeding of the cut material to squaring arms. Both types of log taper adjusters are standard equipment of the machine. They serve to elevate the log axis in horizontal position according to the log taper or to elevate the whole log above the machine bed and to optimally adjust it on the machine bed by means of a driven roller of the log taper adjuster for horizontal feed. 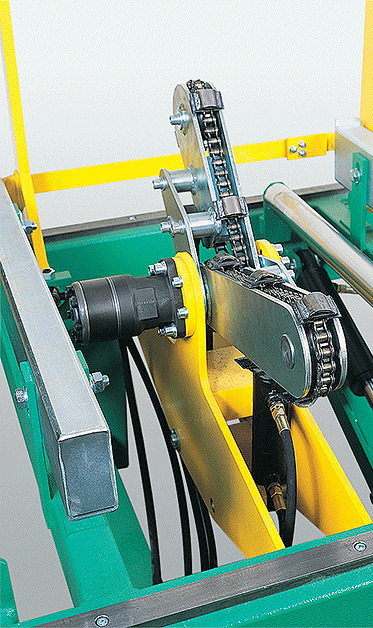 The horizontal feed roller is driven by a hydromotor. 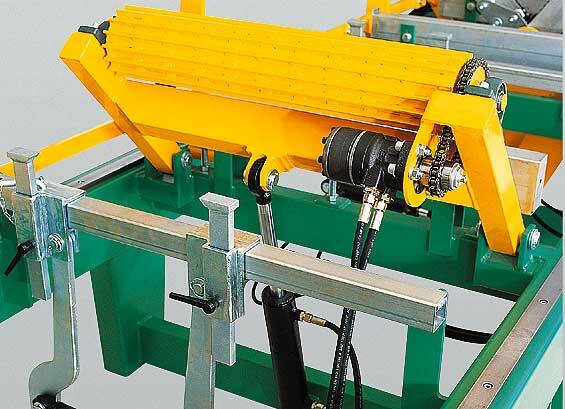 The hydraulic clamps are automatically centered depending on the log cross section or they can be locked in the required position. They can also be used for one-sided clamping of the log against the anti-roll back stops/squaring arms. 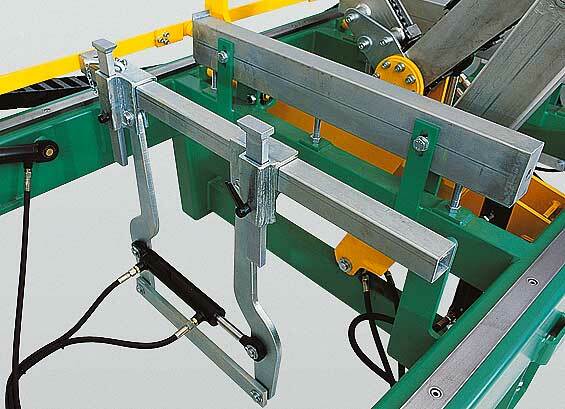 All clamps are controlled together by one button. They are also hydraulically height adjustable according to the trunk shape. 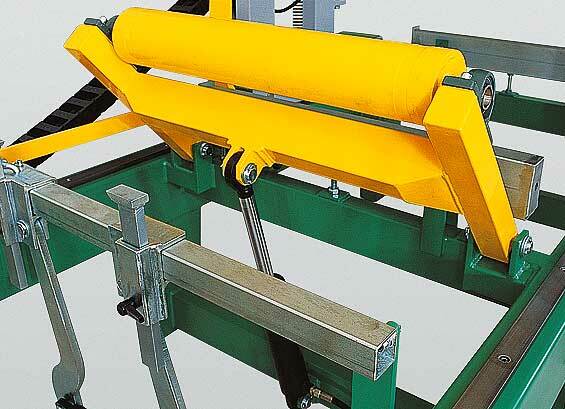 The anti-roll back stops/squaring arms prevent the log from skipping when it is being loaded and turned and when balks are being sawn. All anti-roll back stops/squaring arms are lifted together by one button. The lever mechanism ensures that all anti-roll back stops/squaring arms are always set at the same height. 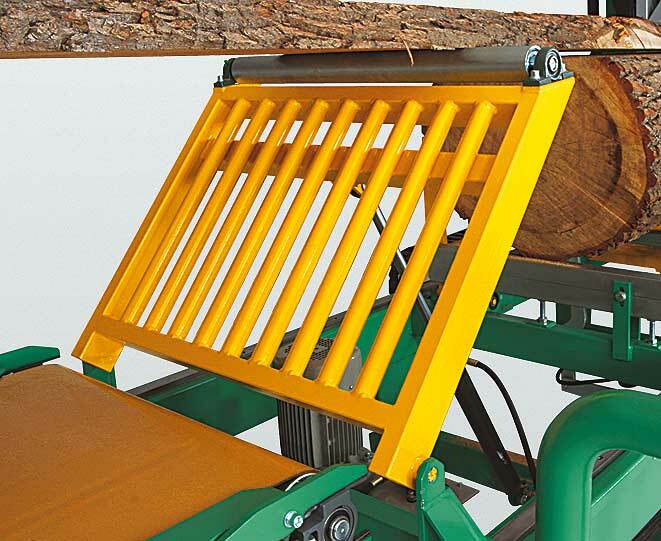 This latest optional extra takes the hard work out of sawn timber removal and cuts out a great deal of unnecessary manhandling – and increases production. Like many good ideas it is simple. 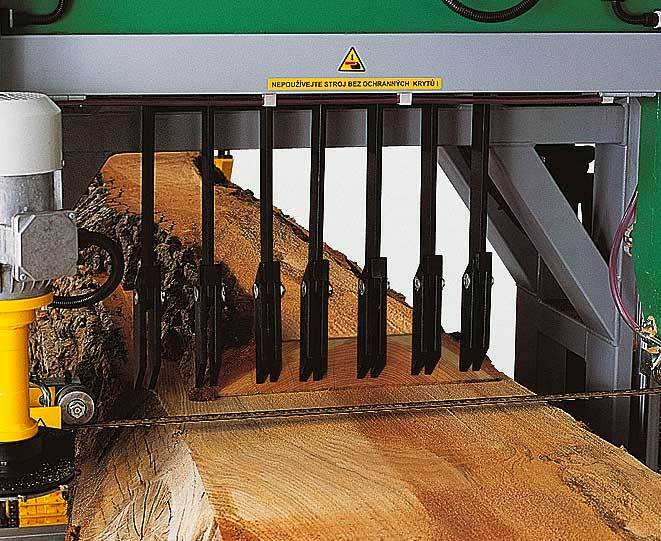 Hinged arms, mounted on the saw headrig, slide along the top surface of the log or previously sawn surface as it is being sawn. Special attachment. 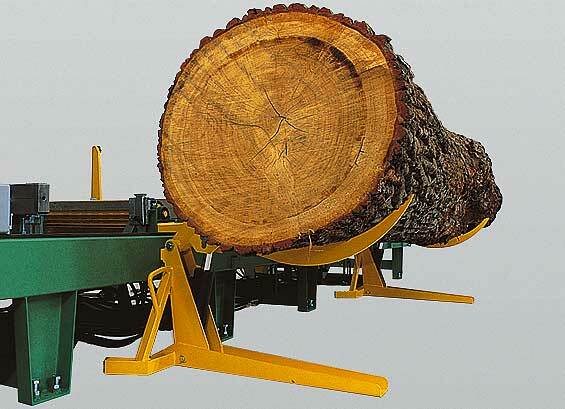 The double-arm log loader enables safe and quick lifting of the log to the machine bed. There are fixing points along the entire base frame so that the individual loaders may be easily moved depending on the length of the log being loaded. 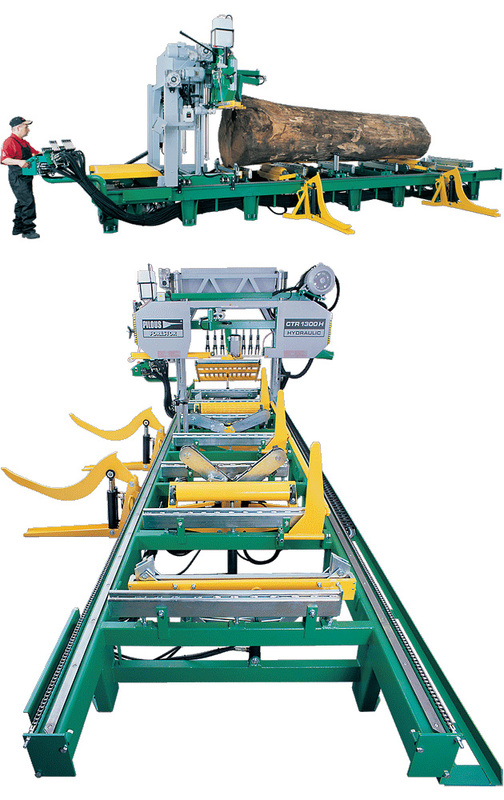 Each loader is separately controlled, which simplifies even handling of extremely tapered logs. 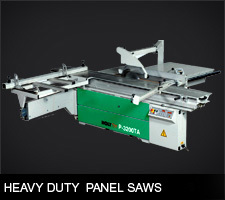 The powerful chain log turner is equipped with two tilting, separately controlled arms. There are chains put on them, driven simultaneously by the hydraulic motor, which makes easy turning of the material. 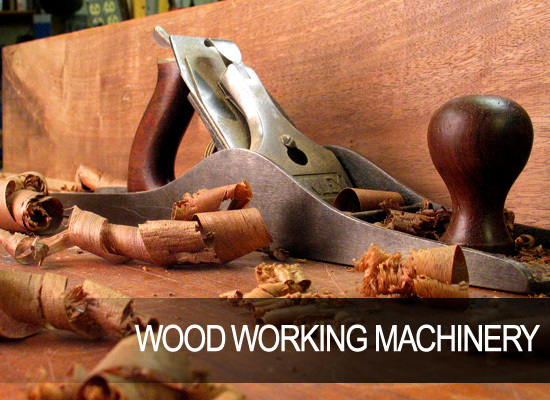 When cutting long timber with their frequent turning, we recommend equipping the machine with a couple of these turners that significantly shorten the needed handling times and thus increase machine productivity.